Reichenau Island in Lake Constance, Southern Germany, is famous for its rich cultural heritage. The island is UNESCO World Heritage Site since 2001. 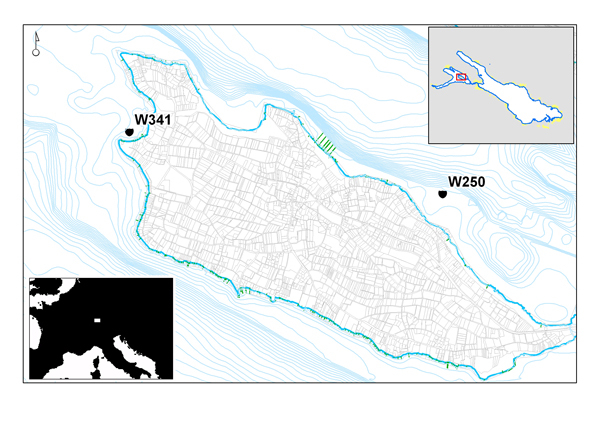 At all times, watercraft played an essential role in the religious, cultural, economic, and social life of the island. Archaeological remains of boats and ships are therefore important sources to the island´s history. When a late medieval vessel was discovered in 2006, the Landesamt für Denkmalpflege had it documented, excavated, and re-buried on site to preserve it from destruction. 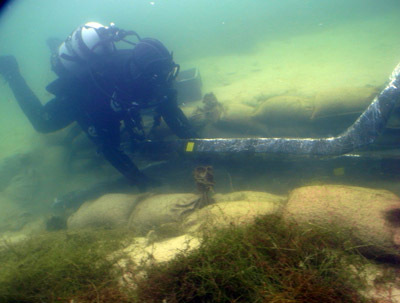 A similar procedure has been completed in autumn 2012 at the site of another Reichenau shipwreck. The vessel had been discovered by H. Blum, Reichenau, in 1998. 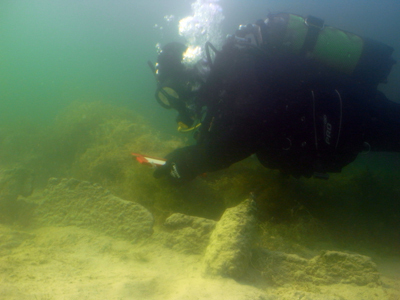 When monitoring dives showed that the vessel was increasingly exposed by erosion processes, contracting to the Landesamt für Denkmalpflege, we carried out a three – weeks diving campaign to document and safeguard the monument. Scientific Divers were M. Billig MA and M. Heine. Documentation of the monument before excavation and reburial works. (c) Courtesy LAD / Mainberger. Uncovered section of the rear end (C) Courtesy LAD / Billig. Right (below) Uncovered section of the rear end (c) Courtesy LAD / Mainberger. 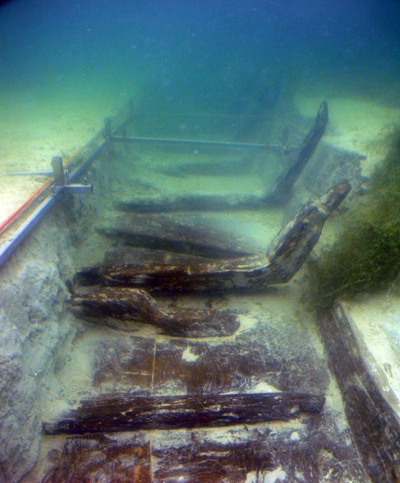 Since only parts of the vessel were exposed from the lake– bed, in a first step, we documented the site and all exposed construction elements with diving archaeological and hydrographic techniques. Next we dredged out the portside section of the ship, uncovering one half of the inside of the vessel for archaeological observation. After finishing underwater documentation we took out all shipbuilding elements that had been protruding from the lake bed. These timbers, planks, frames, and other constructive parts could then be documented at dry land conditions. Meanwhile, we obstructed the edges of the excavation trench with sand bags filled with sand and gravel. The remaining slot could finally receive the removed construction elements. We expect the trench to be filled completely with lake sediments within some months. We will monitor to control if reality will meet our expectations. 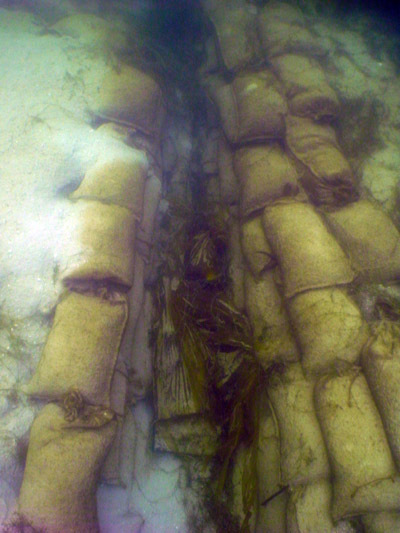 Obstruction of the excavation trench edges with sandbags (c) Courtesy LAD / Mainberger. 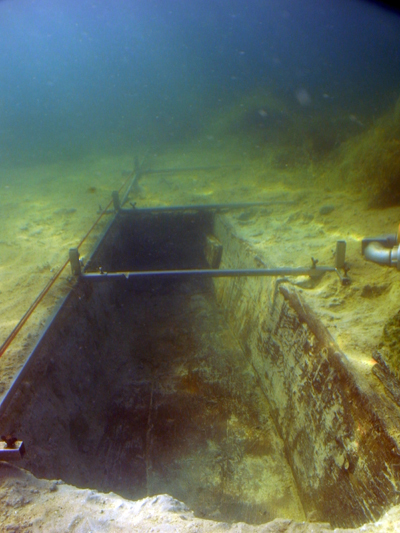 Diver brings a frame into the ship´s grave (c) Courtesy LAD / Mainberger. The ship has been dated to the end of 16th century and is therefore an important archaeological link between the so far known medieval vessels and the sailing ships of early modern times. It´s hull is build completely from oak, with a flat bottom, rising bow and rear parts, and planks and frames connected to each other by wooden pegs. A mast step indicates that we deal with a sailing ship. Only 8 m of the vessel – mid-section and rear end - is conserved. By comparison with other archaeological remains of Lake Constance we can accout for a original length of 12 m.